Proprietary Name: Childrens Pain And Fever What is the Proprietary Name? Non-Proprietary Name: Acetaminophen What is the Non-Proprietary Name? 69842 - Cvs Pharmacy, Inc.
Childrens Pain And Fever with NDC 69842-793 is a a human over the counter drug product labeled by Cvs Pharmacy, Inc.. The generic name of Childrens Pain And Fever is acetaminophen. The product's dosage form is suspension and is administered via oral form. Dosage Form: Suspension - A liquid1 dosage form that contains solid particles dispersed in a liquid vehicle. FDA Application Number: part343 What is the FDA Application Number? Liver warning: This product contains acetaminophen. Severe liver damage may occur if your child takesmore than 5 doses in 24 hours, which is the maximum daily amountwith other drugs containing acetaminophen.Allergy alert: acetaminophen may cause severe skin reactions. Symptoms may include:skin reddeningblistersrashIf a skin reaction occurs, stop use and seek medical help right away.Sore throat warning: if sore throat is severe, persists for more than 2 days, is accompanied or followed by fever, headache, rash, nausea, or vomiting, consult a doctor promptly. With any other drug containing acetaminophen (prescription or nonprescription). 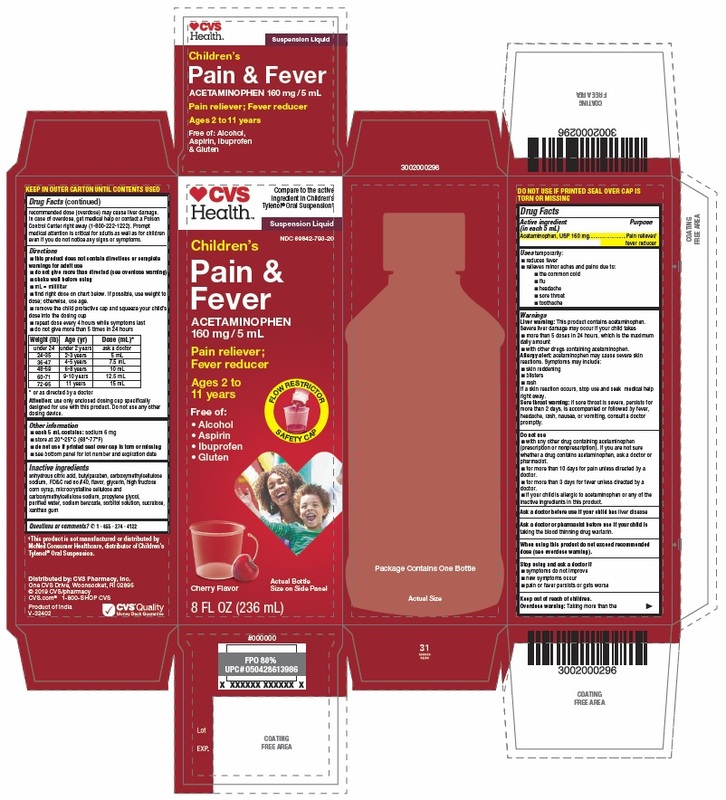 If you are not sure whether a drug contains acetaminophen, ask a doctor or pharmacist.for more than 10 days for pain unless directed by a doctor.for more than 3 days for fever unless directed by a doctor.if your child is allergic to acetaminophen or any of the inactive ingredients in this product. Do not exceed recommended dose (see overdose warning). Overdose warning: Taking more than the recommended dose (overdose) may cause liver damage. In case of overdose, get medical help or contact a Poison Control Center right away (1-800-222-1222). Prompt medical attention is critical for adults as well as for children even if you do not notice any signs or symptoms. * or as directed by a doctorWeight (lb)Age (yr)Dose (mL)*under 24under 2 yearsask a doctor24-352-3 years5 mL36-474-5 years7.5 mL48-596-8 years10 mL60-719-10 years12.5 mL72-9511 years15 mLAttention: use only enclosed dosing cup specifically designed for use with this product. Do not use any other dosing device.